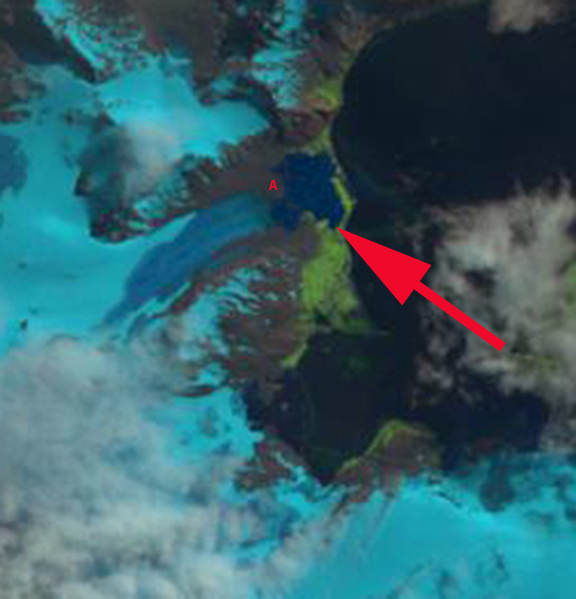 Purvis Glacier is on the norteastern coast of the island, terminating on land near Possession Bay. The British Antarctic Survey (BAS) has mapped many aspects of the island including glacier front changes. 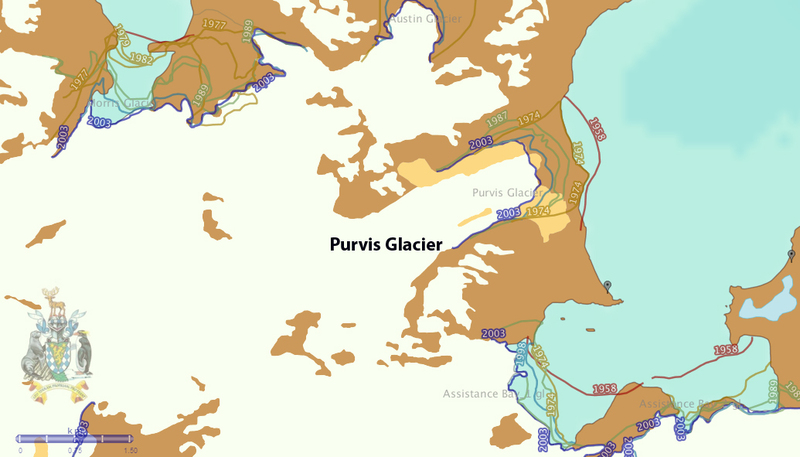 Their mapping indicated below shows that the Purvis Glacier terminus was on the coastline in 1974. Here we examine Landsat imagery from 1999 to 2014 to identify more recent changes. Cook et al (2010) quantified the change in these maps noting that 97% of the 102 coastal glacier retreated between the 1950’s and today. BAS map of Glacier change. 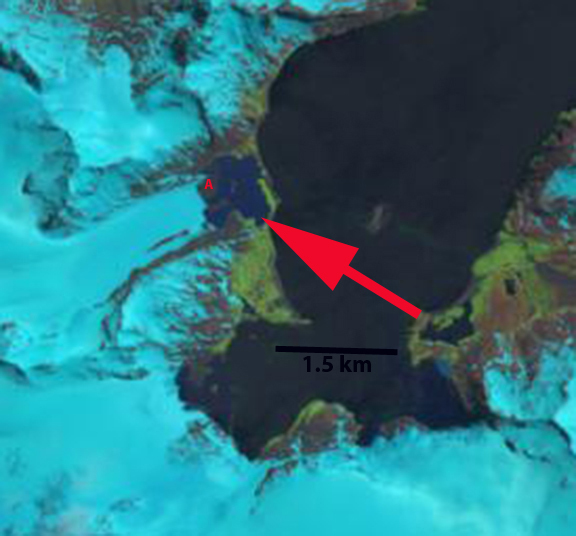 In 1999 the proglacial lake, red arrow, that the glacier terminated in was 300 m wide, indicating a retreat of 300-400 m since 1974. 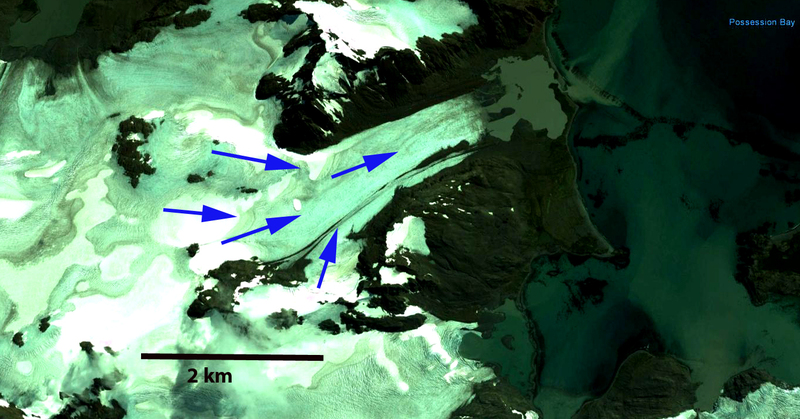 By 2002 the proglacial lake had expanded to a width of 600 m, exposing a peninsula at Point A. By 2013 the proglacial lake had expanded to 1050 m, further exposing the peninsula at Point A. By March 1, 2014 Landsat imagery indicates a retreat of 1100 m since 1974, with most of that retreat occurring since 1979. 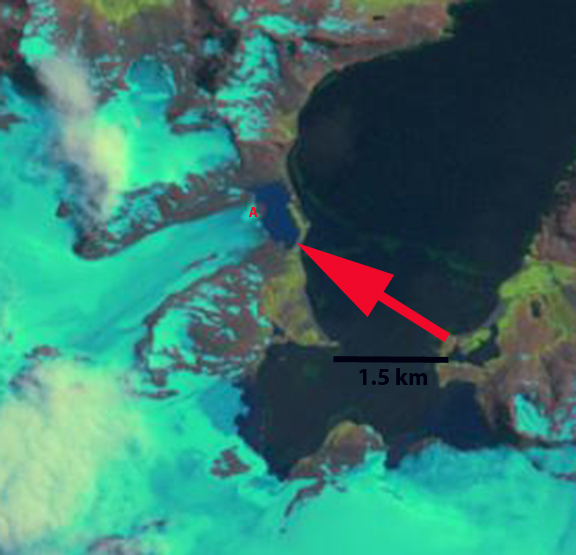 A closer look at the glacier from Google Earth highlights the issue. 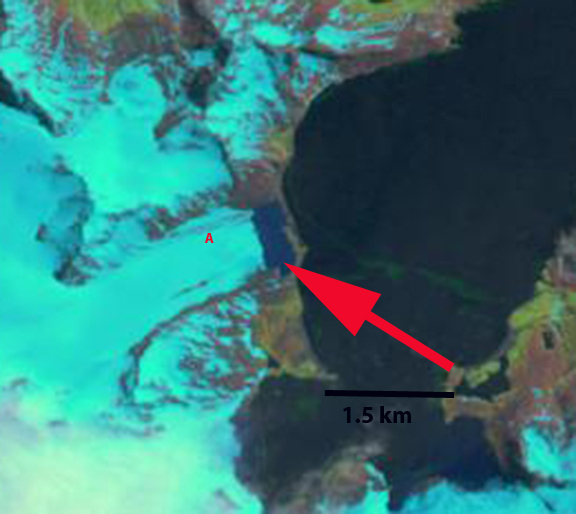 The glacier is fed by relatively low lying snowfields with quite limited areas above 500 m. Sugden, Clapperton and I in a 1989 paper identified the snowline a short distance from here at 400 to 450 m. As the 2011 Google Earth image indicates the remaining snowcover at the end of the melt season is minimal, too little to sustain this glacier (Pelto, 2010). 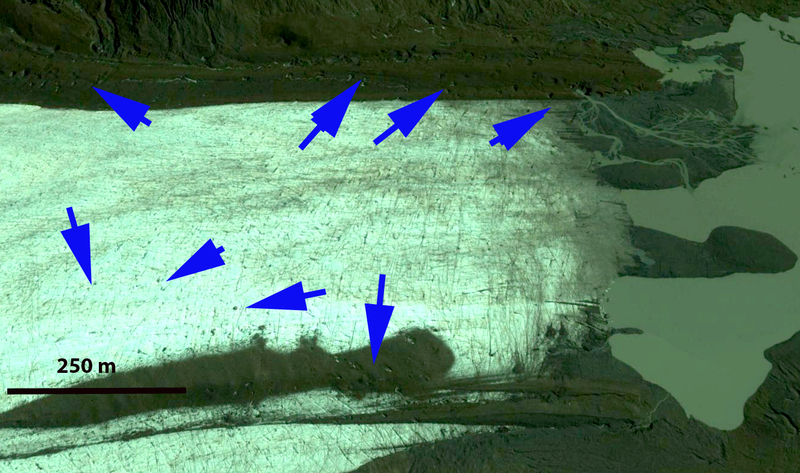 Further a look at the terminus indicates the stagnant nature of the terminus region that will lead to continued retreat, blue arrows note ablation holes in the glacier that do not develop when a glacier is actively moving. The low slope and stagnant nature should preserve an excellent glacial geologic landscape. The glacier is behaving in the same fashion as other land terminating glaciers Heaney Glacier and Konig Glacier. The retreat is less than that of calving glaciers on the island Neumayer Glacier and Ross-Hindle Glacier. This entry was posted in Glacier Observations and tagged glacier global warming, possession bay glacier retreat, purvis glacier retreat, south georgia glacier melt, south georgia glacier retreat. Bookmark the permalink.